My first field guide. A 35 cent bargain. I remember two: Trees of Victoria by Leon Costermans – a permanent resident of the car glove box – and Birds of the Ranges by the Gould League. I am indebted to the authors and illustrators of both. Without them, I may have led a different life. Our Costermans bore the hallmark of a truly great field guide; after years of abuse, we stripped it of every skerrick of re-sale value. One summer, someone put a block of copha in the car glove box to protect it from the sun. When discovered weeks later, everything floated in a pool of coconut fat. It was awesome. Costermans was indestructible. Like the trees inside it, we created the world’s first rip-proof, water-proof, scented, and highly combustible, field guide to eucalypts. What makes a field guide truly great? There are four rules. Every great guide must be: (1) distinctive, (2) attractive, (3) well organized, and most important of all, (4) impeccably accurate. As in life, one small mistake about eye color (‘Your eyes are a beautiful brown’. ‘Aah, they’re green actually’), and into the reject bin we fall. Many of the great guides are also (5) exhaustively comprehensive, but that rule isn’t rigid. Comprehensiveness is equally an asset and a liability. A good field guide can’t be huge, it has to fit in the backpack. Our generation witnessed and abetted the great migration. The migration of information from paper, plastic, canvas and vinyl, to invisible strings of zeroes and ones. The migration to digital. Never despair, books won’t disappear; familiarity breeds contempt for usurpers. It’s hard to find content, let alone contentment, in a replacement – especially one with no pages. Yet resist as we will, the next generation of great field guides won’t be on paper, but on a device. The Compleat Naturalist of the future will treasure a phone more than a library. To my offspring, a bird in the handset is worth three in a book. Accuracy is the hallmark of the great guides to the future. What will we demand from the digital field guides of the future? Be distinctive, attractive, well organized, accurate. These maxims won’t change, but another rule will vanish and a new rule emerge. Comprehensiveness will no longer be a liability. Size won’t matter, as the longest field guide need be no bigger than the shortest. Every entry in a digital field guide can expand and contract like a concertina, from mug-shot to museum and back again. As encyclopaedias shrink in the palm of our hand, the field guides of the future lay prone to a new imperative. Be Popular. In the olde days, greatness led to popularity. In the digital world, popularity leads to greatness; not through imitation, but through content creation. As each user adds and shares new information, the most popular guides will blossom and grow, while the wallflower guides wither and die. Many field guides have migrated from paper to digital. Some synced smoothly from book to ‘app’. Others grew in stature as they shrunk in size. Augmented by libraries of recorded calls, the better guides to frogs and birds can now be viewed and heard on a mobile phone. Can’t tell a Crinia signifera from Crinia parinsignifera? The pictures won’t help, but the calls certainly will. Calls aside, this first generation of digital field guide is characterized by the ‘silent cinema syndrome’. Remember the first silent movies? How quaint and silly they appear? The pioneers of the silent movie transported an old aesthetic to a new technology. They pushed the stage show onto the silver screen. But they created nothing new, beyond a distribution network. They had no concept for the cinematic. The art of cinema evolved later, as unruly directors liberated film from the stagecraft of the theater. The evolution of cinema was enabled by technology and directed by new worlds of imagination. A century beyond the birth of cinema, we squeezed great books onto the small screen. We added a soundtrack. But we are yet to generate a new genre, a new art-form, worthy of the title, the Truly Great Digital Field Guide. We stuck dumb apps on smart phones. A young phone has a great eye, perfect ears, superb short-term memory, an encyclopaedic brain, and looks fantastic. Too anthropomorphic? A little bit creepy? Let’s try again. A modern phone has a sensitive microphone, quality camera, accurate voice recorder and connects to the cloud. Thanks to a GPS, it knows exactly where it is most of the time, which is more than I can claim. The fab guides of the future will feast on every one of these features. Why? Check out my apps. Shazam! What an app. Hear a song you don’t know? Grab your phone, point to the sound and – Shazam – the name of the song, artist and album appears in a flash, with links to biography, lyrics and videos. It’s magical. My phone records a sound bite, sends it to a satellite, compares it to a database, and sends me back the artist’s face. Hmm. If this is possible, then why do I have to scroll manually through frog call after frog call to work out which critter is croaking in the dam? Surely a Truly Great digital field guide should tell me who made the call? The Leafsnap app. Click on the image for a larger, clearer view. (Source: SmartPlanet). What about that camera? 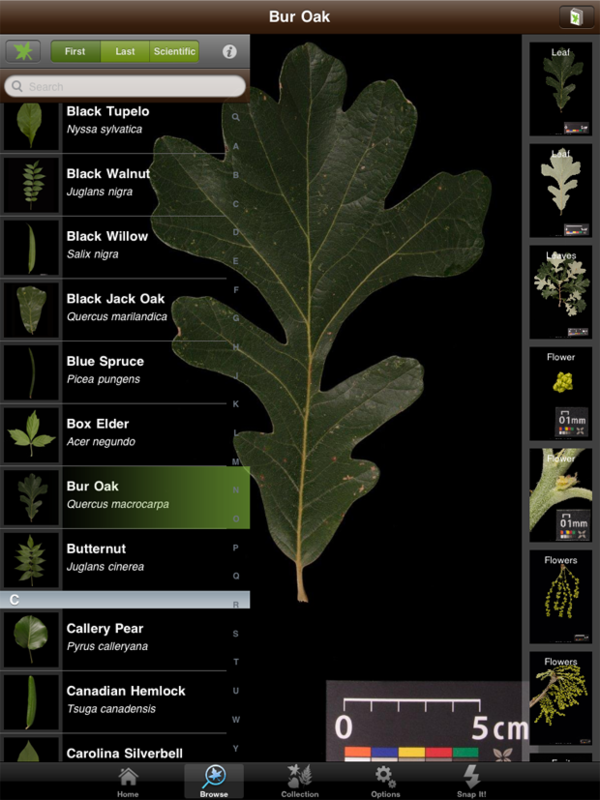 Leafsnap is a ground-breaking app for identifying plants in north-east America. Point your phone at a plant, take a photo of a leaf, beam it to the cloud, and it shoots back a list of potential species, with additional photos of fruits, flowers and distinguishing features. There’s no need to measure the leaf, or to look up a glossary to determine if it’s palmate or pinnate, just point, snap and leave the work to the app. Every meat-eater knows that Leafsnap has limited potential; most leaves look the same to a carnivore. But picture a smorgasbord of photo ID apps, like FruitSnap, BudSnap, BarkSnap and EucSnap. Australia has over 700 species of Eucalyptus, all with distinctive fruits (‘gum-nuts’), buds and bark. Two or three photos should be all it takes for EucSnap to identify most trees. Photograph a fruit, send it to the cloud, and receive a shortlist of possible species, filtered by locality. Snap some buds, send them back up, and the shortlist shrinks again. Can’t tell your Snugglepot from Cuddlepie? Just shoot a gum-nut to the sky. Shazam nails song identification. It gets hurt by Nine Inch Nails every time I play it. It knows its covers, and gets hurt by Johnny Cash every time too, just like me. But bird songs aren’t pop songs. Both versions of hurt always sound the same. The crimson rosella outside my window never does. Blackbird is a song, but a blackbird isn’t. The metaphor is poor, but a bird is an artist with a long improvised repertoire. Blackbirds sing more songs than the Beatles ever sang. 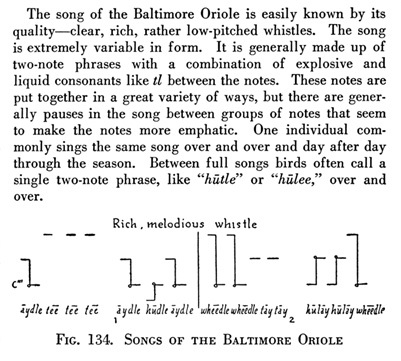 To contain a bird, a library must call upon a discography, not a whistle. To make it harder, blackbirds ain’t blackbirds. Birds have accents. In 2011, a science reporter at the University of Wisconsin wrote an enthusiastic press release about WeBIRD; a phone app to let users, ‘record a nearby bird’s call, submit that song wirelessly to a server and retrieve a positive ID of the species’. Shazam. But a blackbird licked the publicist, and WeBIRD is yet to launch. What went wrong? Apparently, the prototype identified the resident birds of Wisconsin really well. Users could upload a call and download an ID, as the PR promised. But WeBIRD went wonky out of Wisconsin, as many birds sing different tunes in different towns. WeBIRD couldn’t cope with accents. It’s vocal files were too localized. It needs a bigger jukebox. The solution? Collect more songs and data files and try again. Surely, centuries of natural history should provide reams of data to train a smart app? Yes and no. We’ve got piles of information. It’s just the wrong type. Or rather it’s all type. It’s all text. Words are cheap. Since birth, natural history has been subject to this economic dictum of the printing press. Images and sounds are expensive to reproduce, so generations of biologists created ways to translate images and sounds into words. ‘Aydle tee, wheedle tay’. Describing songs with words and squiggles. Click on the image for a larger, clearer view. (Source: Edward Tufte). Botanists penned glossaries to describe undrawn plants: ‘leaves conduplicate, seeds tuberculate, indumentum villose, calyx accrescent’. The efficiency of communication is exemplary. A Handbook to the Plants of Victoria Volume II. Dicotyledons (Willis 1972) distinguishes 2290 species in 832 pages without a single picture. Unburdened by art, both volumes – plus lunch, water, camera and coat – fit snugly in my day-pack. With a budget for paint – one illustration per species – but none for sound, cheerful ornithologists turned to onomatopoeia: ‘Pee-pee-pee-peeooo, Wee-willy-weet-weet, It-wooa-weet-sip, Zzzt zzzt zzzt. Cher-cher-cherry-cherry, Wah-i-wah-i-wah-oo, Twitchy tweedle, Kupa-ko-ko, Lik-lik-lik’. Less cheerful colleagues followed suit: ‘Chop-chop, Four o’clock, Wide-a-wake, Walk to work. Want a whip? It’s for teacher. Tweet-your-juice, Sweet pretty creature’. (All real calls, I assure you). ‘Writing about bird songs is like dancing about architecture’. As Napster broke the music industry, the mp3 file made redundant a century of imaginative onomatopoeia. WeBIRD cannot hear the poetry of a Flame Robin – ‘You may come, if you wish, to the sea’ – in the sonogram of a bird call. LeafSnap cannot see, ‘foliage trifoliate, margins runcinate’ in a snapshot of a leaf. Will we like the field guides of the future? Will EucSnap ever replace my coconut-scented Costermans? Will we stick with our bulky books, long glossaries and child-friendly bird calls? The ‘warm, intimate vinyl’ sounds of the past? Your preferences don’t matter. Neither do mine. You already have a guide, you already value nature. What really matters is – can a phone full of apps help a new generation of ‘digital natives’ to value and conserve the diversity and beauty of the natural world? I hope so. I hope my grand-children pocket a galaxy of guides to nature’s delights, and use it to call on the soundscape of the planet. If they do, they’ll never need to ask, ‘can we squeeze another field guide in the glove box?’ They’ll just need to be careful with the coconut oil. Farnsworth, E.J. et al. (2013). Next-generation field guides. BioScience 63(11), 891-899. [The full text of this paper can be downloaded from this link]. This article triggered this blog post. It gives a fascinating overview of recent developments in digital field guides, although it doesn’t suggest that field guides will one day answer us back. Many thanks to the friendly folk on Twitter for their helpful hints about bird calls and field guides. Costermans was my first too Ian, given to me by bushwalking mates while languishing in hospital with a mangled leg. Later had me hopping around trying to knock down euc samples with one of my crutches…Still in my library. 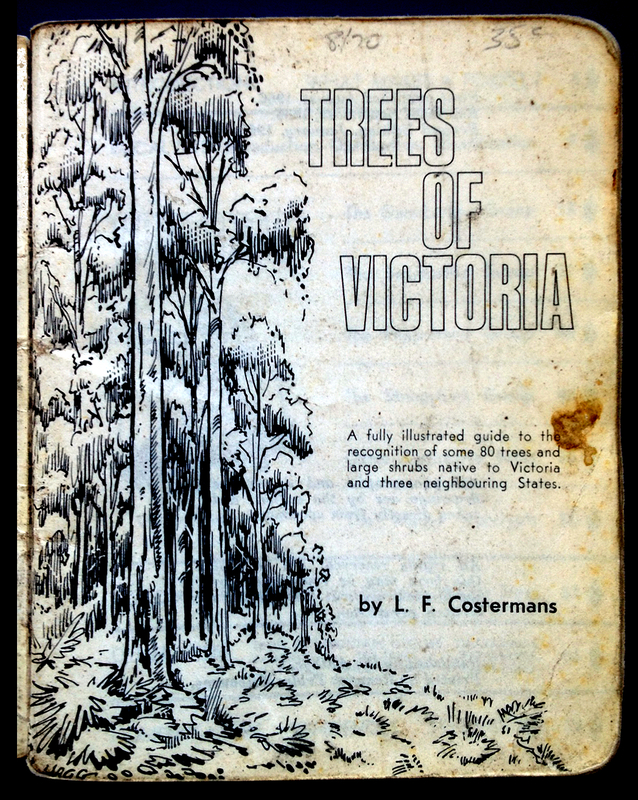 Having used various field guides along the East Coast of Australia, I have always carried Costermans “Native Shrubs and Trees” for reference or cross reference. For local knowledge , I have sniffed out field guides by the Society for Growing Australian Plants. Surprisingly, I have used Leonard Cronins Key guide for “Australian Wildflowers” due to user friendly generic flower shape and colour ID index at the front of the book. A useful start for when one is completely in the dark about a species. Otherwise, Simpson and Day’s Field Guide for Birds and Lamp Forbes and Cade for Grasses are tried and trusted friends. 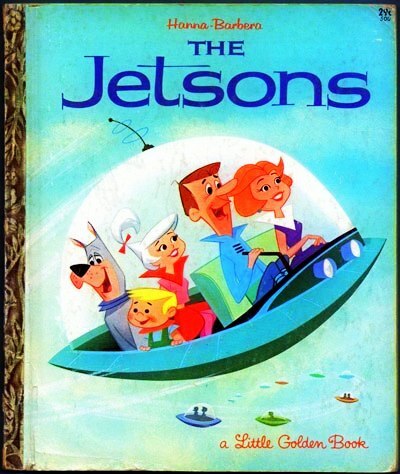 The travelling Serventy family, doing research for CSIRO whilst travelling around Australia, released a monthly edition for kids like me to collect in the seventies. I could not let this opportunity go by without mentioning “Australia’s Wildlife Heritage” chronicling their work and wanderings. Whilst not being a carrying reference or even biologically specific, I would suggest it remains a “go to” reference on Australian ecology. P.S. Agreed. Digital databases are becoming increasingly exhaustive, mobile and updated. Thoroughly enjoyed your article Ian. Yesterday I read a review of Edgar Waite’s ‘Popular Account of Australian Snakes’ published in 1898 in Sydney’s ‘The Evening News’. A first field guide to Australian snakes in which the cautionary tale is told of the chap who cut off his finger to stop the progression of the poison due to a snake bite. If only he had had this excellent guide he would have realised the snake in question was harmless! Your blog appeared at just the right time for me to reflect on just how fascinating and fun good field guides can be. Practical and challenging as you race to identify a specimen, by their nature, always evolving. The first guide I owned was Graham Pizzey’s ‘A Field Guide to the Birds of Australia (1980) with illustrations by Roy Doyle. Just a beautiful publication and still often referred to. I was however very quick to purchase the recently released App version and am mighty pleased I did. It is easy to treasure the hard copy guides, browse the illustrations, sort through the clues to identification and thrill to success! But in concert with digital versions those that enjoy a good field guide have all fields covered. Field guides are publishing’s “the sky’s the limit”, can’t wait to see what comes next! The comments so far have reminded me of my earliest “Nature Study” lessons courtesy of a book in our school library, then precious and new, by John Albert Leach … the first Australian Nature Study book I ever saw. 30 years later the Leach was being thrown out at my children’s rural primary school and I snaffled a copy and it is STILL a much loved book. Until then my only natural history books had been of hedgerows and great big clumsy birds someone called robins, newts and buttercups … so NOT Eyre Peninsula, South Australia! More than that; on Sunday afternoons I was allowed to turn the radi … oops wireless on, to listen to Crosbie Morrison. He taught me to carefully catch a huntsman in Dad’s handkerchief (he did specify Dad’s, so I thought it an important detail) and release it in the garden; about how it was predicted that one day a rhododendron would be found in Australia and about … well, it was an amazing world he introduced me to; way out in the hinterland of Oz. Thank you for such an interesting topic and thus, day. Isn’t it interesting that the (presumably fairly sophisticated) modern technology of WeBird couldn’t cope with “accents” or “dialects” of birds from different regions, but if I play the call of an eastern-states honeyeater to a western honeyeater, the bird will recognise the call and come to investigate. Our best technology is (as yet) no match for a bird brain! Kosciusko Alpine Flora, Costin Gray Wimbush Totterdell about 1961… I bought it! Growing up, the only field guide my parents had was the now old hat Neville Cayley’s ‘What Bird is that?”. For me, later, for plants, my first was Leon Costerman’s book that everyone else seems to have mentioned, then the book that every Sydney based bush regenerator has a well thumbed copy of, Les Robinson’s ‘Field Guide to the Native Plants of Sydney’ (initially a 1991 hard copy and then a 3rd ed’n paperback). I’ve various book field guides for fungi, insects, frogs, reptiles, and especially birds. Haven’t yet graduated to the digital age with field apps, but can see the potential for storage of/access to so much more info. I had a (youngish) birdo colleague comment once in response to bird app users raves, that he thought such people were just being lazy. There was also a short note in the last issue of Australian Birdlife (Vo.2 No. 4, December 2013) p. 13 referencing concern (www.bbc.co.uk) about the use of apps featuring bird song when the species are threatened species – causing disturbance, especially during breeding. I could imagine in the UK, with its large population of bird watchers that this could be an issue. This same issue of Birding Australia also contained a detailed, and rather rave review of the Pizzey and Knight Birds of Australia digital edition. For me, Hal Cogger’s Reptiles and Amphibians of Australia was a real turning-point in my interest in natural history and herpetology in particular. I used to borrow from the public library the edition with the Barking Gecko on the front. Now I have the latest edition with the green tree python (and other editions in between). A new edition is due out in March, and I have it on back-order already! Although Cogger (the book) has always been too heavy for backpacks, it worked just fine for car-based field trips. It had the advantage of providing keys for ALL known species, and was not geographically limited, covering all of Australia. A true natural history classic. I should also put in a mention a new book: Marian Anstis’ Frogs and Tadpoles of Australia. Although way too heavy for backpacks, the book is an amazing achievement and totally awe-inspriring. Hi Ian, Thanks for another entertaining and informative blog. I agree with Tim Barlow about Plains Wandering and am keen to see the next iteration. Your readers might be interested to know about ‘Trust Trees’ the app for the National Trust’s Victorian Register of Significant Trees. ‘Trust Trees’ brought the 30 year old Register to a wider audience and assisted us to protect and advocate for Significant Trees. The free app was launched in April 2011. There are currently more than 4500 users. By comparison, only 21 paper copies of the Register had been sold in the nine months prior to the launch of the app. Hi Ian, what an interesting post! I’ve been hoping that someone will invent the equivalent of a tricorder to cope with the huge diversity of botanical things in WA – wouldn’t it be great to shine a small light onto a section of leaf or flower and identify the plant from the frequencies bouncing off its DNA (a future refinement of spectroscopy)? Come to think of it, perhaps it would work for thin-skinned animals too (frogs, and possibly birds) but probably not reptiles. I can’t comment on digital apps as I’m the humble user of an iphone; in this case the “i” stands for “idiot”. The website Florabase is probably as close as it gets to a digital app, but still requires a knowledge of at least family, and hopefully genus, to save hours of trawling through data in a hit-and-miss fashion. But how to identify a leafless stick with no flowers or fruit…? P.S. Please do write a post about scientific heroes; it would be a fascinating read. – Birds. Cayley’s ‘WBIT’ (a legend in it’s own time!) followed closely by the brilliant Gould League series ‘birds of Victoria’- required bed-time reading, at the time! – Mammals. A 1960’s edition of Ellis Troughton’s ‘Furred Mammals Of Australia’; I’m sure I photocopied the entire book! And Wood Jone’s ‘Mammals of South Australia’; exotic, yet local, for a Victorian. – Herps. Cogger! – goes without saying. – Veg. A copy of the 35c Costerman’s, along with Jean Gaibraith’s guide (with pictures & plates!). I have stronger and better memories of these books than of any others I read as a teenager, no doubt because I returned to them, over and over. A recent Vic ID series not mentioned yet is Peter Marriot’s trail-blazing ‘Moths of Victoria’, published by the Ent. Soc. Vic. Vic has 2,000+ species of moth. They are significant ecosystem elements, yet precious little is known about them. These ID guides (book &CD) open onto a world of amazing diversity, colour and form. I would have at least 20 field guides birds, plants, reptiles, animals and then the regional ones and I think they certainly “date” me in both their age and chronological order! Great article. Not only is it insightful and thought provoking, but it is beautifully written (especially for a scientist!). I wish I could write like that. Congratulations. I think my first FG was Freshwater Fishes and Rivers of Australia by John S Lake from 1971. I still have it – complete with aftermarket plastic covering. Sadly many of the species that he considered to be widespread and abundant are now teetering on the brink.